The Game Room series is a great way to enjoy nostalgic gaming experiences as well as try classic video games for the first time. I happily did both things while preparing for my Centipede and Pitfall! reviews. Unfortunately though, not every game stands the test of time. Some games are pretty tough to get into if you didn’t play them when they were first released. Lunar Lander is like that. Sure, it’s historically important, but I doubt many Windows Phone gamers will actually care to play it. 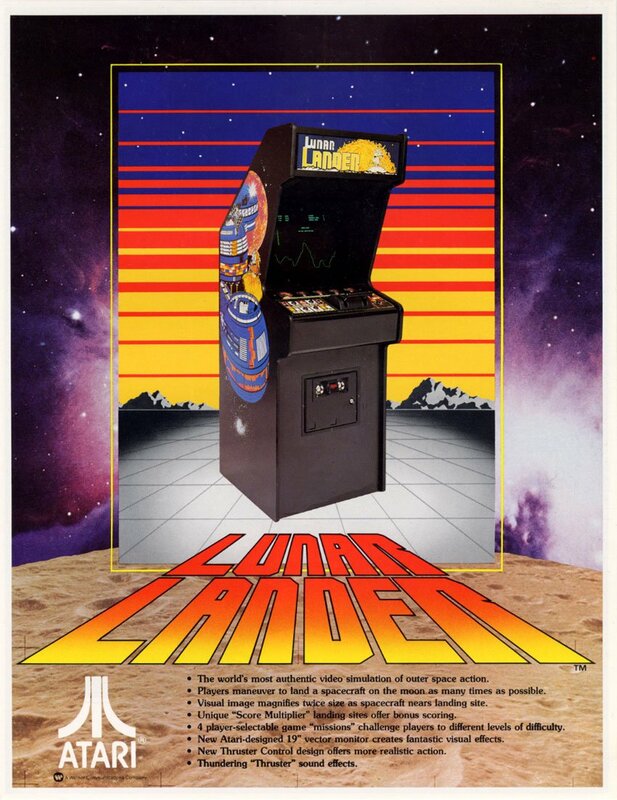 Lunar Lander blasted off into arcades in 1979, the year of my birth. Its arcade competition that year consisted primarily of Space Invaders (1978) and Galaxian. While those two games feature science fiction themes and aliens to blast, Lunar Lander is grounded in reality. The player pilots a lunar landing module as it descends to Earth’s moon. Death comes not from unfriendly visitors but from crashing into the landscape or even just landing too quickly – again, a more realistic setup than the competition. This is still a video game though, so players do get more chances to play until they run out of fuel. Rocket past the break for our fuel review. Lunar Lander’s controls simplify the task of piloting a spacecraft while still feeling authentic. Two buttons rotate the craft left or right up to 90 degrees – it’s impossible to turn upside-down for some reason. The Abort button enrages Bible thumpers, I mean instantly blasts the lander straight up and away from the ground at the expense of 100 fuel units. In the arcades, thrust was controlled by an actual lever. The farther up the lever is pushed, the more the craft’s rocket blasts and the more fuel it burns. The Windows Phone version does a good job approximating the lever with a slider on the right side of the screen. Clearly it lacks the tactile sensation that a physical lever would provide, but the arcade experience essentially survives intact. Players have a lot to monitor if they want to succeed in Lunar Lander. First, they must pick a landing spot. The terrain never changes but bonus spots do. These points have a blinking number beneath them that shows how the score will be multiplied if the ship crashes or lands there. After successful landings, the bonus spots usually reset to different points. They are essential to scoring well, so you’ll almost always want to go for them. To get those points, you’ll have to master the art of landing. It’s not easy, due in part to Lunar Lander’s camera system. The game switches to a zoomed-in view as the lander nears the terrain. It’s a good idea poorly executed. The camera often zoomed in on the top portion of the central mountain even as I tried to land on the lowest point of the mountain, which remained off-screen until the last second. It would make more sense to center the camera on the player’s ship instead of trying to zoom in on an incorrectly-guessed landing target. Regardless of camera issues, the actual game play is fairly challenging. It probably took me 20 or 30 tries before I successfully landed the craft. The ship must be horizontally lined up with the potential landing spot, for starters. The bonus spots are usually quite small and aiming more than 1 or 2 pixels off results in a crash. Gaining control over inertia is important too. As you near the landing area, you’ll want to fire off the thruster in short bursts until your downward speed reaches zero. Then it’s a matter of keeping the craft just above the ground until you’re comfortable letting it slowly drop. If the ship’s speed is greater than 10, the landing will fail, so you have to fire small thruster bursts until pretty much the last moment if you hope to land. Patience and skill are required to succeed. Even if new players aren’t put off by Lunar Lander’s steep learning curve, they’ll also have to look past the antiquated graphics. 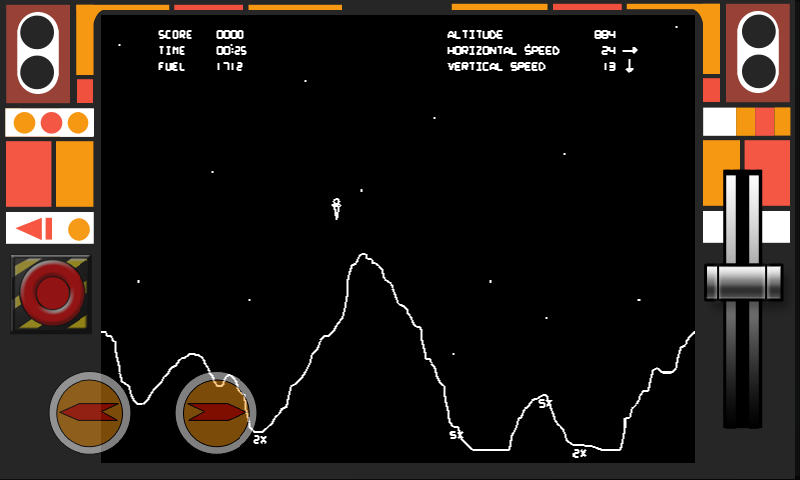 Lunar Lander was Atari’s first vector graphics game. “Vector graphics is the use of geometrical primitives such as points, lines, curves, and shapes or polygon(s), which are all based on mathematical equations, to represent images,” according to Wikipedia. This allowed the ship in Lunar Lander to rotate much more smoothly than traditional raster graphics, which would have required the use of a separate sprite for every possible frame of animation. The game is also able to zoom in when the ship gets close to terrain thanks to the magic of vectors. Unfortunately, a special black-and-white monitor was required to produce those graphics – color vector graphics didn’t come along until Atari’s Tempest in 1982. Many older arcade games still look charming to modern eyes – Pac-Man, Space Invaders, and Centipede, to name a few. 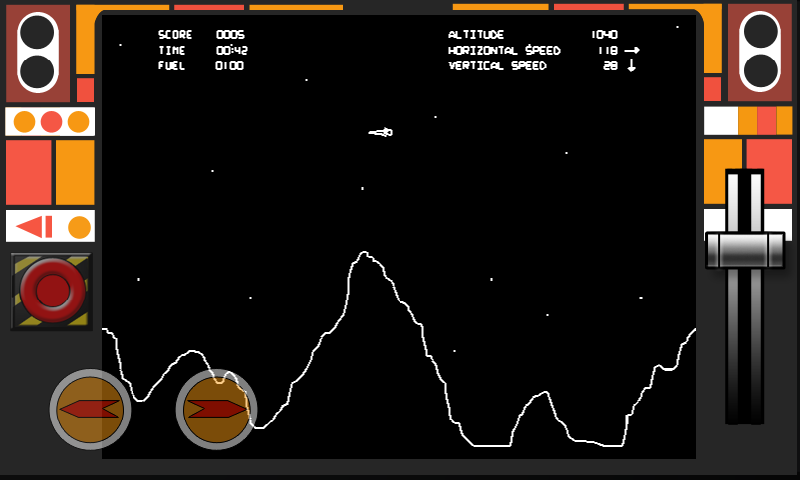 But Lunar Lander doesn’t hold up as well because of the absence of color and the extreme simplicity of its graphics. Even in 1979, there were prettier games, such as Namco’s Galaxian (the predecessor to Galaga). It’s not that a colorless, completely-plain-looking game can’t be fun nowadays. Lunar Lander just doesn’t have any hint of the visual charms that most games use to draw players in. Plus the player’s ship is incredibly tiny – about 2 mm on my Samsung Focus. I’d hate to play this game on a device like the LG Quantum with its smaller screen. As with other Game Room titles, Lunar Lander awards medals in three categories after each game: Score, Survival, and Playtime. Each comes in bronze, silver, and gold varieties. It takes 750 points to grab the gold Score medal. A perfect landing on a 5X bonus spot awards 250 points, so practicing until you can do that thrice is key. The gold Survival medal should come along with a successful Score attempt, and the Playtime medal is just as easy as in other Game Room games. Flyer image courtesy of The Arcade Flyer Archive. A total of three Achievements come from earning medals during gameplay. The standard Game Room three secret Achievements (beat your high score, watch the credits, and play with crappy tilt controls) and three location-based Achievements are also present. Lunar Lander’s sole unique Achievement comes from playing during a full moon. The game checks your phone’s date setting, so it’s possible to set the date back to a past full moon (like April 18, 2011) and instantly unlock the Achievement. Just make sure you don’t set it to a future date as that will cause problems with Xbox Live. I can’t imagine that the crossover between surviving Lunar Lander fans and Windows Phone users is all that large. With so many other possible Game Room titles that Microsoft could have chosen to port, it’s a mystery why this version of Lunar Lander even exists. But it’s here and it’s a relatively easy 200 GamerScore for Achievement hunters, plus it will help Xbox 360 and PC gamers make progress towards those platforms’ Game Room Achievements. Why do you think I’m reviewing this anyway? Let’s just hope Microsoft manages the Windows Phone Xbox Live portfolio more wisely in the future. Lunar Lander costs a mighty $2.99 and has a free trial. Land here (Zune link) to grab it on the Marketplace.